'88 911 Cab. 58k. superb body & paint. Major service done. 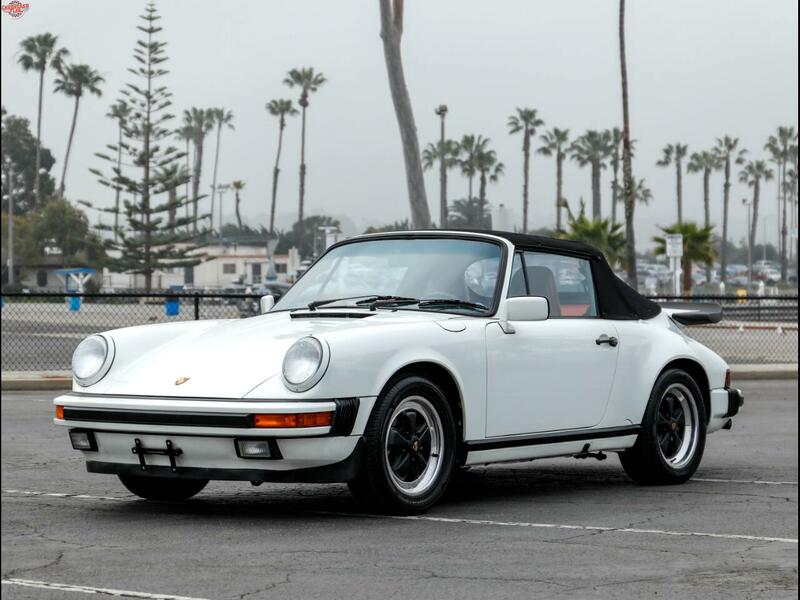 Chequered Flag International is pleased to offer this 1988 Porsche 911 G50 Cabriolet in Grand Prix White with Red interior. 58,540 miles with clean Carfax. Perfect body with excellent paint, all stickers in place including option code sticker under hood. Very nice interior with some light wear on the seats, recently replaced soft top. Dash, door panels and carpets are good. Mechanically superb. Just has a complete check out and major service, including:- New shock absorbers all round, new clutch, full service with plugs, all filters and belts, valve adjustment, etc,. Full A/C service with R134 update, new engine insulation pad, replaced axle boots, changed crankshaft seal, replaced shifter bushings. In all around $12k at retail parts and labor. It runs and drives as a low mileage G50 911 should and its totally dialed in and ready to enjoy. Inspections encouraged. Comes with soft top boot, tools, jack & spare. All sales AS-IS. Sales tax and license fees due if delivered in California.